New Delhi: Either by design or coincidence, 17 November will hold a dual significance in contemporary Tibetan history. In 1950, on this date, Tenzin Gyatso was officially enthroned as the full temporal leader of Tibet, a 15-year-old charged with the responsibility of facing down a bellicose China. On Monday, exactly 58 years later, the Tibetan community will meet in Dharamsala to, some say, contemplate a future without the leadership of Gyatso, better known as the Dalai Lama. The Dalai Lama himself summoned this special meeting, under Article 59 of the Tibetan charter, after he publicly stated that he is despaired of the Tibetan demand for autonomy that he has himself championed. “Very clearly, His Holiness has said: ‘My approach is not working’," says Youdon Aukatsang, a member of the Tibetan government-in-exile. “Many would still want to believe in his approach, but some differ. Some think that the time to change this Middle Way approach is at hand." Changing that approach could involve a new, official demand for outright independence from China, instead of just autonomy. Particularly among the youth, the concept of a struggle for total independence has caught fire. Earlier this year, as protests in Tibet turned violent and as protesters disrupted the passage of the Olympic torch to Beijing, the Dalai Lama had expressed his disapproval at the turn of events. Mint had reported, at the time, that student movements and the Tibetan Youth Congress had questioned the wisdom of a peaceful agitation in the face of Chinese violence. But it would be a mistake to think of the youth as a monolithic entity, warns Chenga Tsering, a career development adviser for Tibetan youngsters in New Delhi. “I meet many youngsters who support the Middle Way, and of course the members of the Tibetan Youth Congress support independence," Tsering says. “Most of the articles on Tibetan web sites are in favour of complete independence as well." Tsering points out that the Dalai Lama views the Dharamsala meeting as a barometer of Tibetan public opinion. “He wanted to get a sense of where the public is," Tsering says. “He has always said that the Tibetan issue is not the Dalai Lama’s issue but the people’s issue." In a statement, the Dalai Lama said: “This special meeting is being convened with the express purpose of providing a forum to understand the real opinions and views of the Tibetan people... It must be clear to all that this special meeting does not have any agenda for reaching a particular predetermined outcome." Some foresee that, in the near future, the Dalai Lama wishes to move into a sort of semi-retirement, away from the political leadership of Tibet. “I think he would walk away if he could, but the people won’t let him," Aukatsang says. “We don’t have another visionary leader like him. Nobody can fill that vacuum." So long has the Dalai Lama combined the political leadership of Tibet with his religious leadership that the two roles have now grown indistinguishable. “Even if he walks away from the political leadership, nobody can take away his status as a religious leader," says Geshe Lhakdor, for many years the Dalai Lama’s translator and now the director of the Library of Tibetan Works and Archives in Dharamsala. Clearly, though, Tibetans have begun to think about the Dalai Lama’s successor. Last week, Lobsang Sangay, a senior fellow at Harvard Law School and a Tibetan, published an essay in which he called for the Dalai Lama to break from the traditional method of appointment to the title and nominate a young successor right away. Tibetan tradition holds that the Dalai Lama reincarnates himself upon his passing, to be found through a meticulous search. “However, being born…is only a process: what is crucial is the capacity of incarnate lamas to transfer their soul/consciousness through the womb," Dr Sangay wrote. “[T]he same spiritual mystical capacity could be utilized to transfer the soul/consciousness to an adult of the lama’s own choosing." “His Holiness is very liberal, and he has said that he would be interested in an appointment style of succession," says Aukatsang. 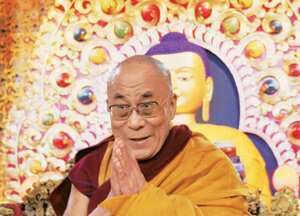 Perhaps to allow for discussion of such matters, the Dalai Lama himself will not attend the meeting at Dharamsala. “He thinks his presence will act as a pressure and overwhelm people," Aukatsang says. Has the Dalai Lama’s statement of having “given up" dampened morale in the Tibetan community? “It has dampened morale a little," admits Aukatsang. “But then, we’ve always had hope as our strongest weapon."